/ Modified aug 14, 2018 10:11 a.m.
A lightning strike over east Tucson. The National Weather Service's Tucson weather radar is back up and running, after being offline twice in the last three days. The problems started with a Friday afternoon thunderstorm. The Tucson Doppler Radar sits like a giant golf ball on a tee in the foothills southeast of town. Since it's the tallest structure in the area, it attracts the occasional lightning bolt. Friday afternoon it was hit hard enough to destroy some essential electronics. Forecaster Aaron Hardin says the Weather Service has backup systems in place. "We still have satellite data available to us, still have rain gauges in those areas. So we wouldn't be completely blind. We would still be able to see the storms but it would be hard to ascertain how strong they are," Hardin said. Tucson's radar was out of action for about a day starting Friday night, and again for a few hours on Monday. 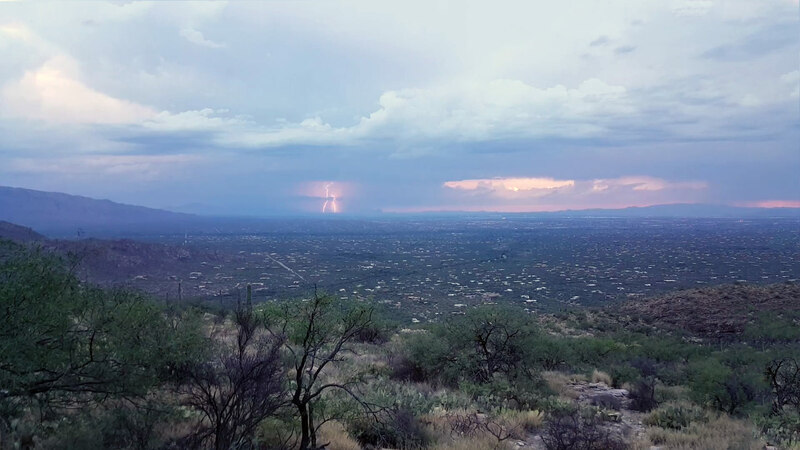 The Weather Service says the system takes 10 to 15 lightning strikes every monsoon, but it's rare for the system to be knocked out completely.